Hoffman’s opened its first Broward location just in time for the holidays. Here’s why you should stop by the new Las Olas store this season. Before visitors can even take a bite, they’re enveloped by a rich, chocolatey smell that ushers them through the door. This is the sixth Hoffman’s location for the famed-Palm Beach chocolatier, and its first in Broward (with more to come). But Jarett Levan, president of BBX Capital, parent company of Hoffman’s Chocolates, says the smell gets people every time. 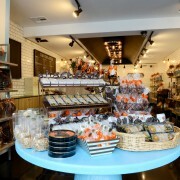 “We’re known for our quality,” he says, adding that his favorite chocolates include the twice-dipped, dark- chocolate-covered pretzels and the salted caramels.